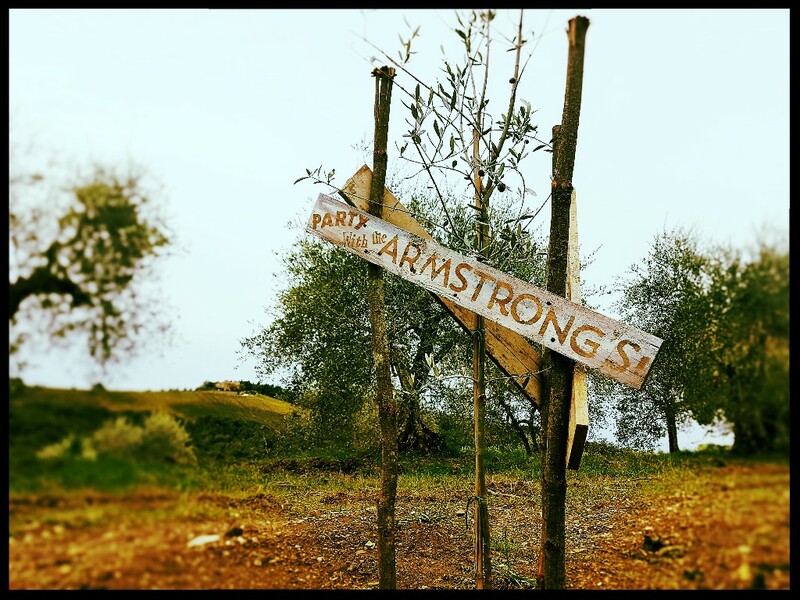 Stories from deepest, darkest Chianti, from your friends at Podere Patrignone. Podere Patrignone has 5 apartments and a large villa in deepest Chianti, available to rent from April-October. For more information, please visit our website. Welcome to our latest newsletter, sneaked in before the end of an exciting 2016, and just in time to wish you all a very Merry Christmas and a Happy, Healthy 2017. We hope you enjoy the update. As well as the occasional wedding and BFG (Big Family Gathering), Patrignone hosts groups of all kinds, from cycling to yoga, from landscape painting to cookery weeks. 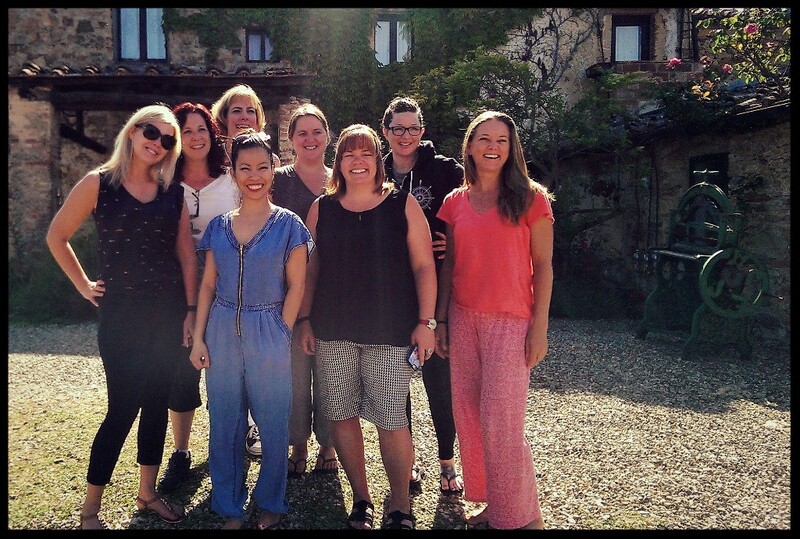 In May this year we hosted a group of lovely women on a spiritual retreat, run and organised by Rachel, and her colleagues Jen and Debbie from Souldust, who organise womens' personal development weeks all over the world. They spent a lot of time around Patrignone having workshops, break-out sessions, and yoga classes. As well as providing them with healthy, organic Tuscan soul-food, we also helped them to plan their daily excursions. The ladies were a delight to have around, invited me in on their inspiring yoga sessions, and enthusiastically partook of some experimental meals combining traditional Tuscan cuisine with gluten and dairy-free ingredients. The buckwheat focaccia was a winner! Our second group of the season was the Inspired Workshops Tuscan Photography course, a very enthusiastic, dedicated, and seriously talented bunch of shutterbugs, who amazed us with their super-early sunrise shoots and late nights charging around the Tuscan countryside. The course was run by a group of professional photographers which included Elizabeth & Trey Homan, Bert & Cindy Behnke, and Jeff & Carolle Dachowski. Many beautiful shots were taken and a good time was had by all. There was even a wedding, which, considering the nature of the guests, may well have been the most photographed wedding in history. Again, we helped with the itinerary planning, provided most of the meals, and lent them our doggies to shoot (metaphorically). Thank you again to one and all for being such easy and fun guests. 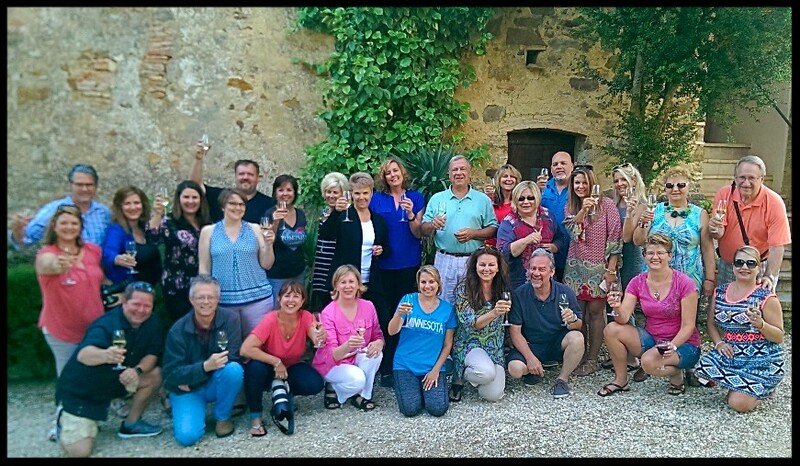 If you, or anyone you know, is interested in hosting a group or a workshop in Tuscany and would like to know a bit about us and how we can help you plan the perfect week, please get in touch or check out the page on our website. As you may well remember from an earlier newsletter, we have had repeated problems with herons stealing our koi and goldfish. Previously, the only way to keep them out was to tie lots of ugly white nylon string between the trees and across the pond. Hardly an ideal solution. So, I got crafty - perhaps for the first time in my life! 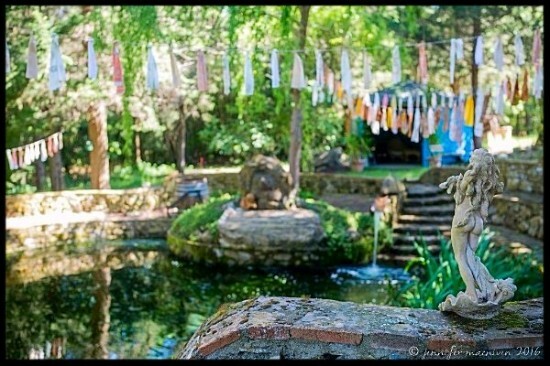 Our pond area has always been a special place to rest and relax, with the soothing sound of running water. But, I hope you'll agree that the rag bunting is an improvement. The herons have been back, admired my handiwork, and left without skewering any fish. Mission complete. Thanks to Jen MacNiven for this, and many other gorgeous photos. As you may know, we host a limited number of weddings every year. As many Patrignone B&G's (Bride & Groom) will testify, a Patrignone wedding is not just about the Big Day, but the collective experiences of the whole week. And we were extremely honoured this year to host the wedding of Nicole and Mike in September. Mike & Nicole chose Patrignone as their venue having come here on holiday some years ago. Bringing their nearest and dearest all the way from Canada, Mike and Nicole tied the knot in the magnificent wedding room in the Palazzo Publico in Siena, right on the Piazza del Campo. This really is a special venue in a very special location. The ceremony was followed by a reception here on the Terracotta Terrazza in the September sunshine. Nicu, our full time jack-of-all-trades, believes it will never rain at a Patrignone wedding....let's hope he's right. Following a Patrignone tradition, we planted an olive tree, a symbol of longevity and fertility, to commemorate the Big Day. It was a fantastic wedding week, with a lovely couple, and a smashing group of family and friends. We hope to see you all back here again in the not too distant future. 2017 will see two more weddings, those of Canadians Lauren & Dennis, and Brits Sarah & Pete. We are really looking forward to sharing these special weeks with you. See you soon! If you would like to know anything about getting married here in Tuscany, please get in touch, or start by having a look at our dedicated wedding page. 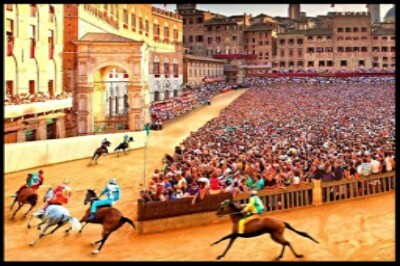 Talking of Siena, if you are planning on visiting, or have already done so, you should not miss the film about it's famous horse race, the Palio, which takes place twice each year. The film, of the same name, offers a fascinating insight in to the darker side of this fantastic race, the bribes, the deals, and the strong passions aroused in the Senese who live for it. Highly recommended. Sorry if you weren't in this group shot (Simon kept forgetting to take photos and videos), but we'd like to offer our heart-felt thanks to everyone who came for the harvest this year and worked so hard. It is, as these guys will testify, tough, but rewarding work, out in the fresh Tuscan air and in spectacular scenery. This year's harvest was smaller than we'd hoped, producing around 450 litres (compared to 2015's 850 litres) - yields and volumes were down across the region. It is a great shame, as we received an overwhelming response to Simon's pre-harvest request for orders, with orders for way more than we produced. So we had to reduce all orders to accommodate everyone (thank you again to all of you who so graciously took the cut to your order with such understanding). In light of this we are sorry that we are unable to sell any more oil until the 2017 harvest, apart from a few little tins we have for guests..
Our pickers had such fun, that many of this year's squad have already booked their rooms for the 2017 harvest, which will commence on Monday 30th October....crazy cats! However, this does mean that we are pretty full for the first two weeks. The third week of the harvest (week commencing 13th November) is usually a little different to the first two weeks. As we are entirely at the mercy of the weather when we harvest (we can't pick in the wet as it damages the trees) we need the third week as a buffer. 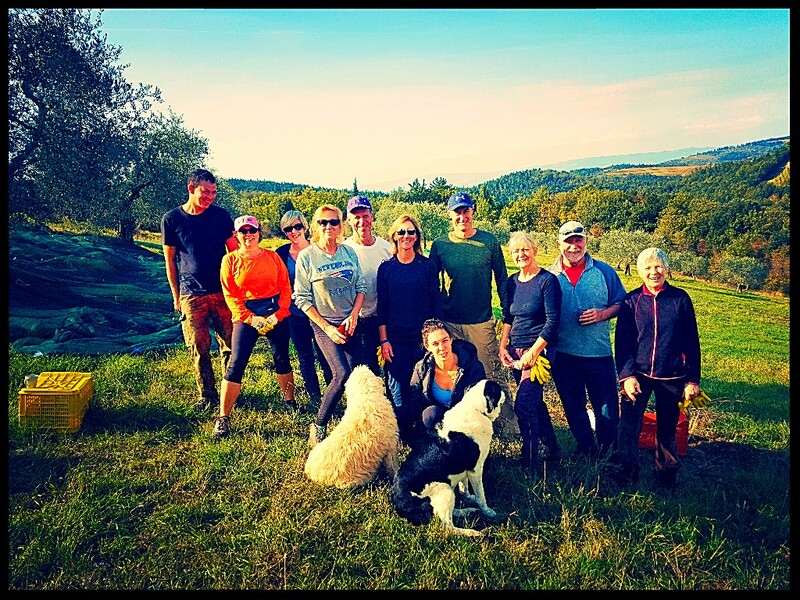 This year we picked for 2 days in the 3rd week, but our willing workers helped out with other vital tasks, such as stripping down the vegetable garden and an entertaining trip to the Chianti Cashmere Goat Farm to collect goat poo! 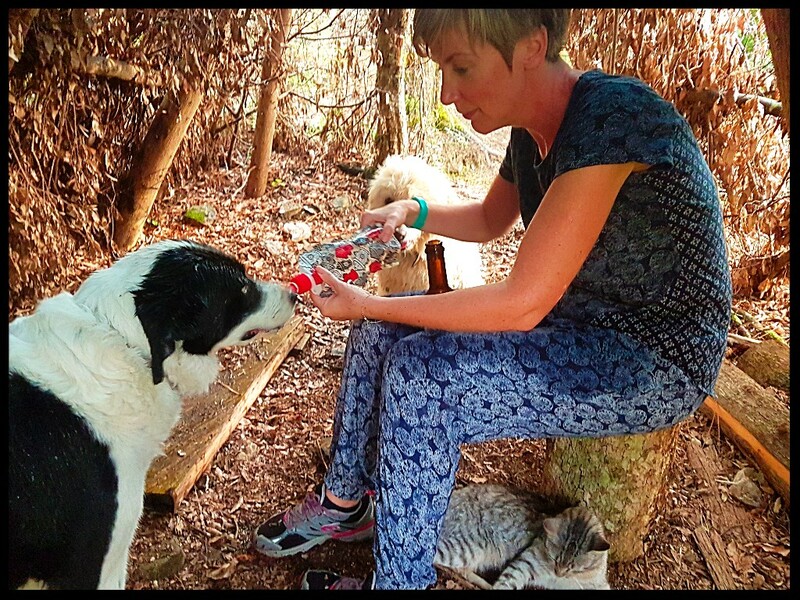 OK, digging poo may not be your idea of a good time but, I can promise you, it has been a popular day out with our volunteers, who get to pet the goats and their majestic, beautiful guardians, the Abruzzese shepherd dogs. If this sounds like your bag and you are available for that third week in November, drop me a line. Looking to treat someone special to something equally special? Check out Chianti Cashmere who produce the most beautiful, sustainable cashmere. Or you can visit them and their gorgeous giant fluffy white dogs every day between 4-7pm, just 5 minutes outside of Radda in Chianti. Could you spend a summer in Tuscany? If the idea of living and working in Italy for a summer really appeals, then perhaps you would be interested in our housekeepers position? Every year we employ someone for 7-8 months to help us take care of our 15-bedroom agriturismo. We have 5 apartments and a large villa, which we rent as 'self-catering' holiday villas (although we do offer B&B occasionally). We have flexible start days (not just Saturday-to-Saturday), so cleaning is usually spread over the course of the week. Your job is to clean the apartments, wash and iron linens, prepare breakfast (when necessary), and help me prepare and serve the weekly Tuscan Banquet to our guests. In exchange we provide you with a small, self-contained cottage with garden, 2 days off a week, paid holiday, and an opportunity to live the dream! It is pretty hard work and you will need to be fit and healthy. And you will need a car for your days off (so be prepared to drive over from the UK or sort out a 7-month lease). You cannot live here for 7 - 8 months on bicycle power alone! 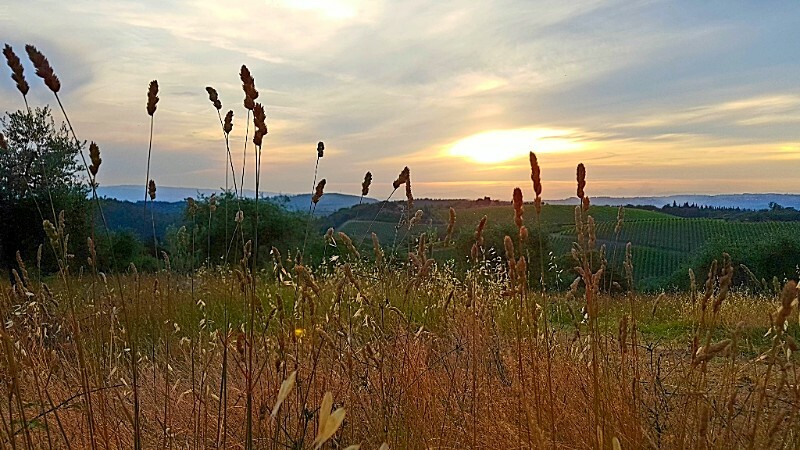 Tuscany is an amazing place to live, and a summer at Patrignone could be a life-changing experience, so if you (or someone you know) would like to experience the life, or would simply like to know more about it, please get in touch. 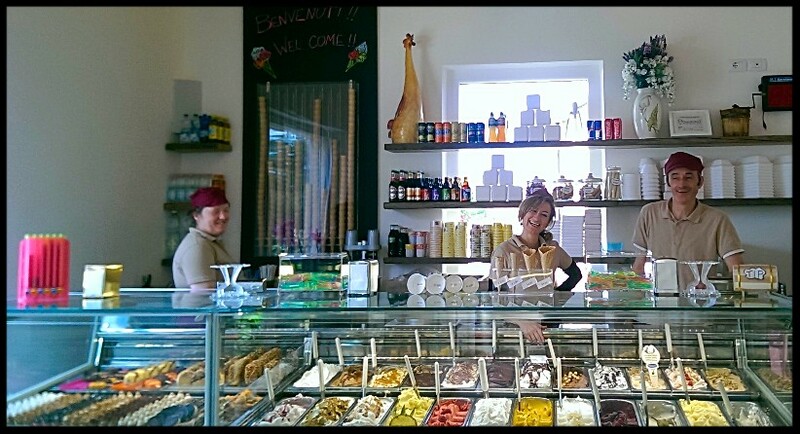 The long awaited reopening of the famous Gelateria di Castellina in May was a resounding success. The new site is much easier to reach, and much bigger, meaning more ice cream, more cakes, an exciting range of toppings and variations, an excellent selection of local artisan beers and a large, shady seating area outside to enjoy your purchase. You can even watch all of this yummy stuff being prepared in the glass-sided kitchen, and Simone (the sainted maker of this most delicious gelato, on the right of the photo) will do the odd tour and take you through the process when he has the time (not very often!). Sam, our middle son, is in the same class as one of their daughters, so I have high hopes for his prospects! 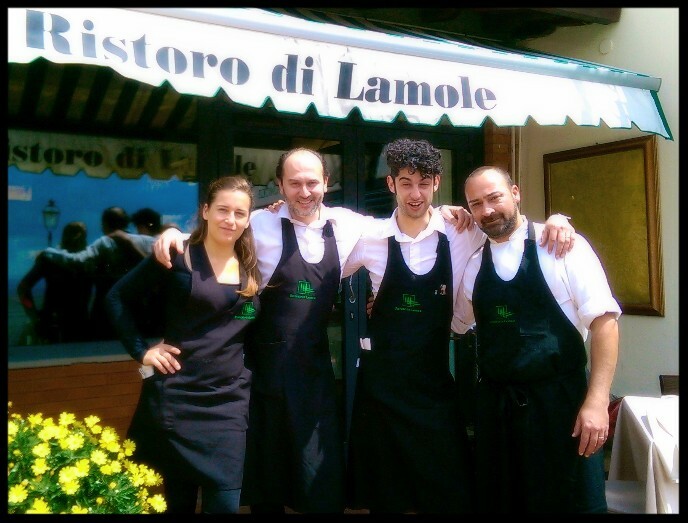 I am sure I have mentioned Ristoro di Lamole before, but this gem is worth a reminder. This restaurant is 40 minutes' drive along a beautiful winding road, near the town of Panzano in Chianti. 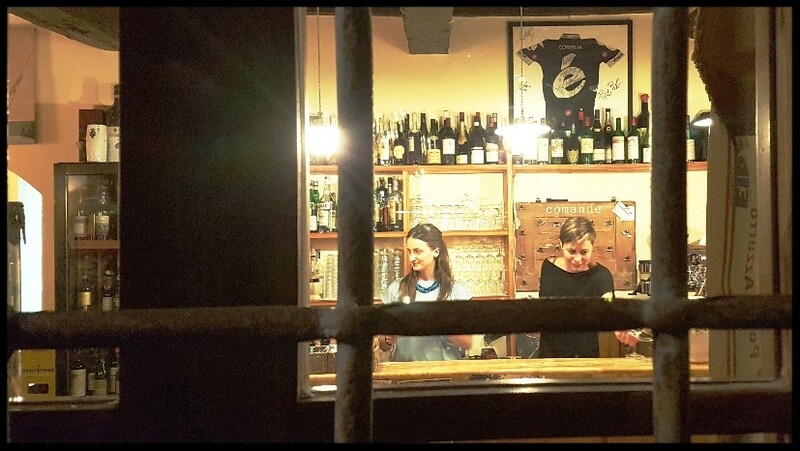 You can spend several hours enjoying the delicious food, served by charming and multi-lingual staff with, arguably, one of the best views in Chiantishire. I have been lucky enough to go back twice this year (and remember, I don't get out much) and still savour every visit. There are many great places to eat in Tuscany, but this is somewhere truly magical and an absolute must for couples enjoying a romantic getaway in the area. We also managed to return to Le Panzanelle in Luccarelli, also near Panzano. This is one of my favourites. The food is unpretentious, and tastes like proper home cooked Italian fare. The menu isn't massive, but everything is always delicious and the prices are very reasonable. Friday night is fish night, with a great choice of fresh fish and seafood. The restaurant is owned by two young Italian women who like using the odd surprising ingredient or throwing in a bit of Spanish influence. Add a great wine list, and you have a real winner, so you will need to book. It is a small place, tastefully decorated, and with many a great write up including by the River Cafe in London. For more advice on where to eat whilst you are here have a look at the restaurant page on our website, or download a copy of the Patrignone Big Book before travelling. 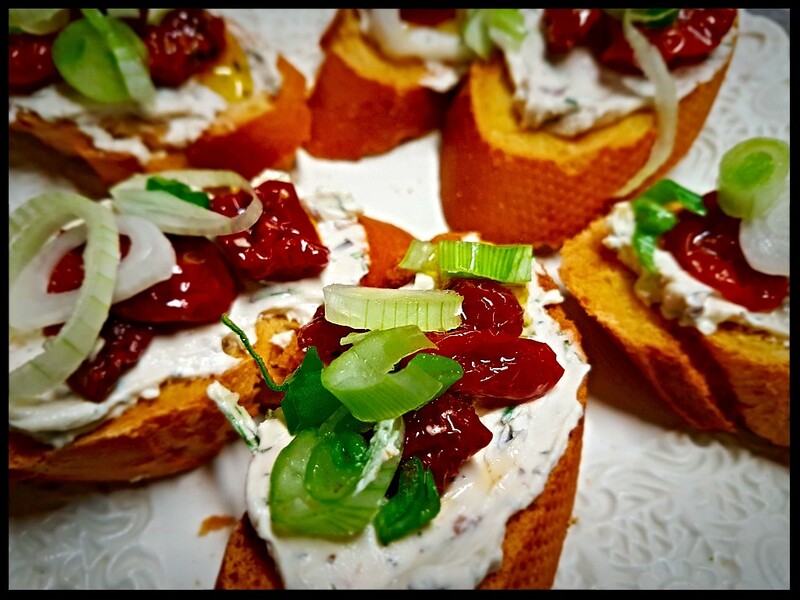 Combine the mascarpone with the chopped herbs and anchovies and a good grind of black pepper. Toast the baguette slices. Smear each slice with a good splodge of the herby mascarpone. Pile a few pieces of tomato on top and then scatter the onion over. Serve immediately. 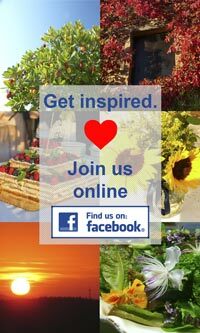 For many more of our recipesvisit us on our Facebook page. I had to include the tale of this little summer adventure. During the wedding week, when all was a little hectic here but our children were off at the beach with Nonna, Simon & I set off for a walk with the dogs. We were soon joined by the pitter patter of tiny feet... Tinker (our naughty, bitey cat, sitting underneath me in the photo) had followed us. We did try to shoo him home as he is a bit of a lightweight, and Charlie & Lola wanted a proper long hack through the woods. However, the weather was on Tinker's side, and we hadn't got very far before an enormous storm struck. As luck would have it, we were not very far from a small shelter left by a woodcutter a few years ago, and we made a run for it. The rain was coming down hard, and Tinker had to be rescued from cowering under a nearby tree. So here we are, cosy under the plastic tarp, waiting out the storm. Luckily we had the pooches' water bottles (thank you Carol and Santo!) and a couple of beers! 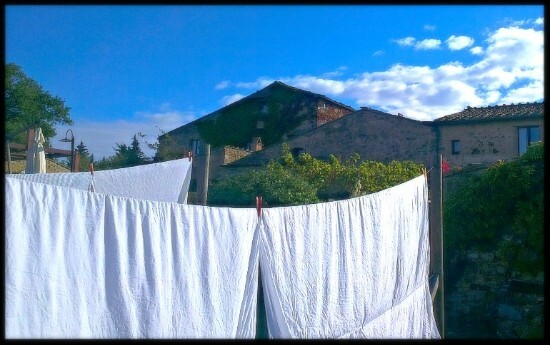 Ah, and here's our lovely Lola on one steamy July day! 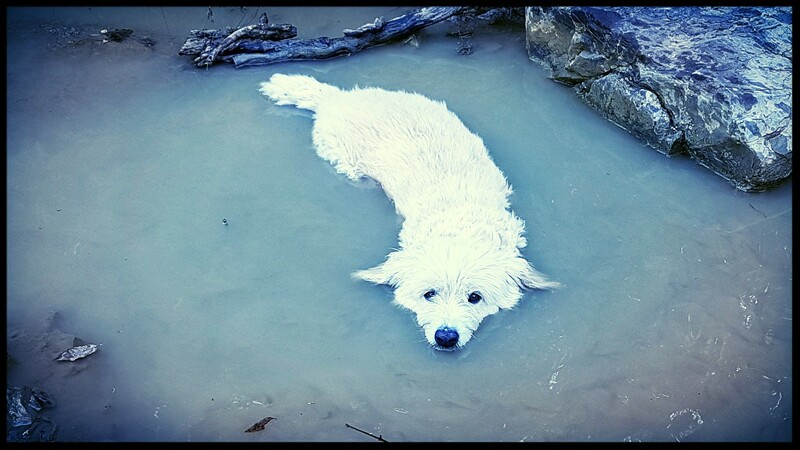 It was hot and she does love a paddle, but I have never seen her immerse herself quite so fully before. Great alligator impression! Poor Lola has been slowing down and displaying some weakness in her hind quarters, and by November she was showing real difficulty in moving. After a couple of consultations with local vets and some x-rays, Lola was found to be suffering from arthritis in her lower spine. Being only 8 years old she is a little young to be stiffening up, but we were told that her weight may be an issue here. Despite the fact that we feed our dogs only once a day and give them less than the amount recommended on the packet, Lola tends to be a little chunky. This chunkiness tends to grow as the season progresses...could it be a coincidence that Lola's weight grows with our guest count, despite our pleas NOT to feed our animals? I also think that Nicu, our faithful handyman, is a bit of a sucker for those pleading deep brown eyes. I am hoping that our guests and Nicu will resist Lola's charms for the sake of her health. Hopefully with these efforts, and the incredibly expensive pills they have given her, we will see an improvement very soon. In the meantime, she is greatly missed by Charlie & I on our walks. If you want to keep up to date with all of our informal newsy news join our Friends of Patrignone page on Facebook. An enormous "Thank You" to all of you who sent money for our Earthquake Appeal. 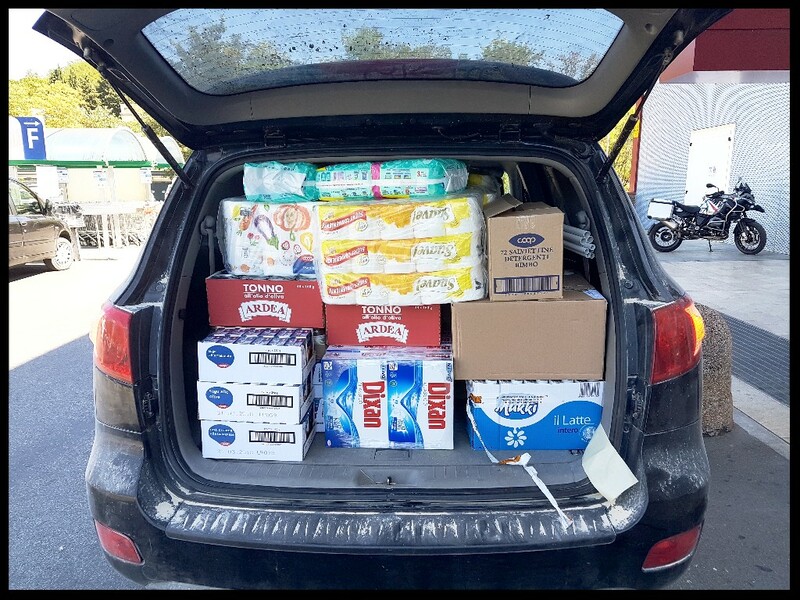 We raised over €1500 which we immediately spent on essential toiletries and food. We took it all to our courier depot, Maiboxes Etc, who took it all direct to the earthquake zones near Perugia. We cannot imagine how awful it must be to loose your home and everything in it, and it is hard to know what to do to help. Giving cash usually seems far removed, and this way we could make a direct and immediate impact. There is so much to see and do in Tuscany, that it is all too tempting to try and do it all. Exhausting! So try and set aside at least one day for indulging a passion, Italian style. Maybe take a bike tour, an art class, or how about a cookery lesson? There are several cookery schools in the area, each offering a very different experience and style. At Patrignone we offer a half-day hands-on cookery class: not a demonstration, but a proper role-your-sleeves-up and get stuck-in masterclass. We teach you how to cook a complete meal, with an antipasto or two, fresh baked bread, you get to make fresh pasta, cook a meat or fish dish, and bake some cantuccini 'biscotti' or other dolce. All produce is locally sourced, if not home-grown. There are around 4 hours of hands-on cooking and instruction before you sit down to eat the fruits of your efforts. If you have friends or family who would rather hang out by the pool than get messy in the kitchen, they can join you for the meal. 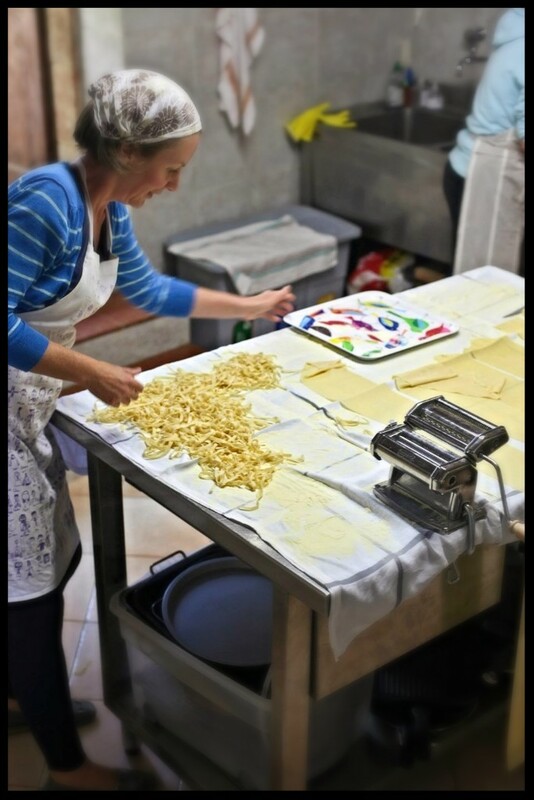 You are likely to eat some of the best food you have ever tasted whilst here in Tuscany, and taking a cookery class will help you replicate some of those flavours at home. For information on this and other things to do to enhance your trip see our website. That's all for this time. Hope you enjoyed it. If you are thinking of coming to Tuscany next summer, and would like to hear more about our Tuscan holiday cottages and vacation villas here at Podere Patrignone, please email us using the button below, reply to this email, or say hello to us on Facebook. Thanks for listening. Verity. You can find our various hangouts by clicking on buttons below. Please join us! And if you'd like to spread the love, please do! That would be lovely. Use these buttons to send us into the unknown. Taste everything, order everything, drink everything. You will be happy.